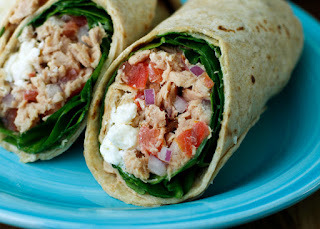 Light, fresh, and full of flavor, this Spinach and Feta Tuna Wrap made with wild caught tuna packed in olive oil, fresh spinach, and a cool feta dressing is my go-to healthy summer meal! Can I just tell you how excited I am that warmer weather has finally arrived in my neck of the woods? Normally I'm partial to fall, but for some reason this year I am super pumped about spring. Flowers are blooming, birds are chirping, and there just seems to be a feel-good buzz in the air. This year, the warm weather has simply made me feel lighter and refreshed! When the spring and summer temps rise, not only are my spirits lighter, but so are my meals. I crave light, fresh dishes that don't weigh me down. 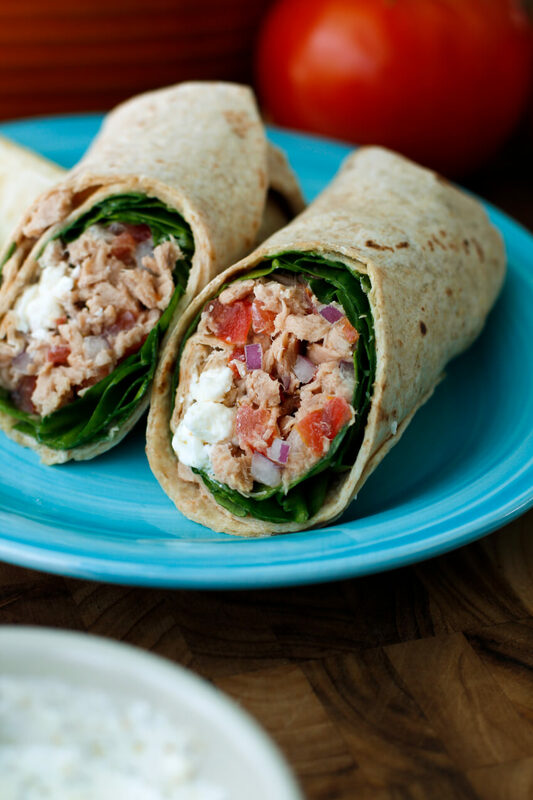 One of my go-to choices for a light and healthy meal is this easy to make tuna wrap! This is no ordinary tuna wrap, though. When you think tuna, you probably think of tuna packed in water, am I right? Not in my tuna wrap! 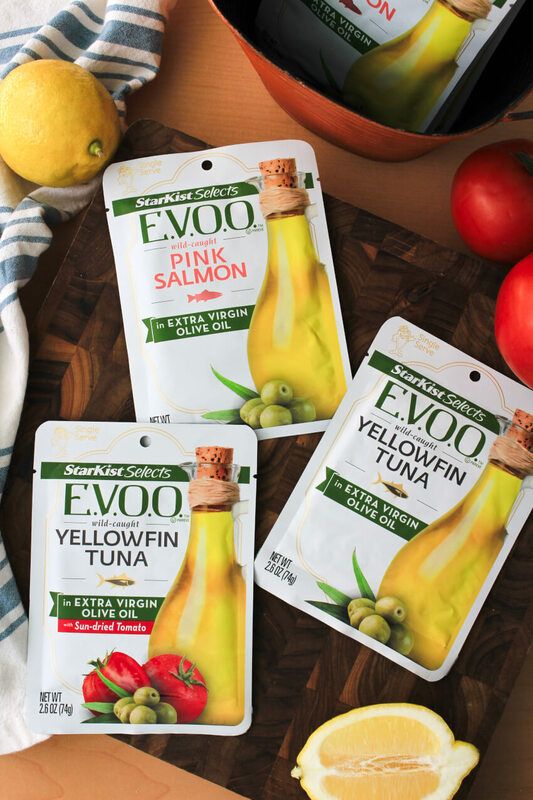 I say move over tuna in water because there's a new tuna in town that has won my heart...StarKist Selects E.V.O.O.™ Yellowfin Tuna! Have you tried the StarKist Selects E.V.O.O.™ packets yet? If you haven't, you totally should! Not only is there the Yellowfin Tuna option, but the folks at StarKist have pulled out all the stops with StarKist Selects E.V.O.O.™ Wild-Caught Pink Salmon, and StarKist Selects E.V.O.O.™ Yellowfin Tuna with Sun-dried Tomato, too! Tuna that is packed in cold-pressed extra virgin olive oil is common in other parts of the world and once you try it, you will know why. StarKist Selects E.V.O.O.™ Yellowfin Tuna is packed with rich tuna flavor and is super tender. You don't even need to load it up with mayo to make it taste amazing. I love it right out of the packet! With just a few simple, quality ingredients, it is a total winner in my book. I'm talking just Yellowfin tuna, extra virgin olive oil, and salt. Healthy, clean eating, protein-packed goodness in every bite. 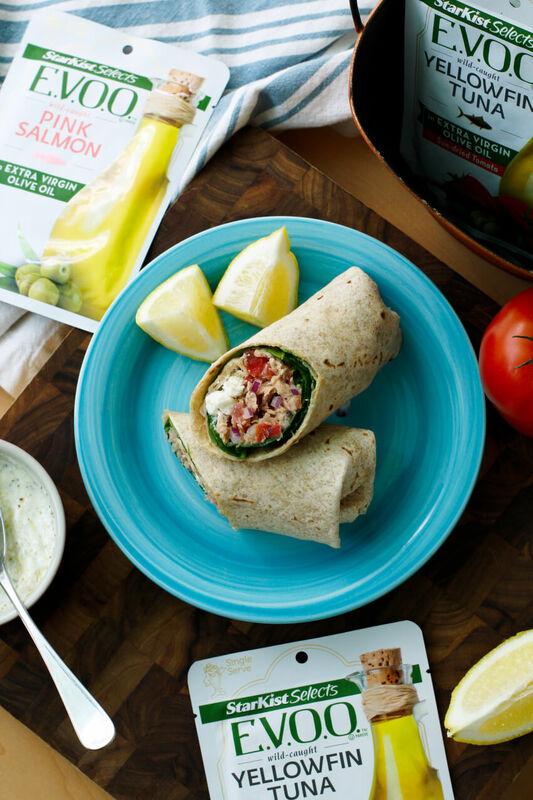 For this wrap, StarKist Selects E.V.O.O.™ Yellowfin Tuna is paired with a cool and creamy feta dressing and fresh spinach. The dressing is made with a few simple ingredients you probably already have in your pantry and is the perfect bold complement to the mellow flavored tuna. As always, spinach is a natural choice for wraps boasting oodles of vitamins and minerals. The only thing I might change about this recipe in the future is trying it out with the StarKist Selects E.V.O.O.™ Yellowfin Tuna with Sun-dried Tomato. Sun-dried tomato would be an amazing addition to this recipe. What is your go-to summer meal? Let me know in the comments below! If you try the StarKist Selects E.V.O.O.™ packets this summer, I'd be willing to bet you will fall in love with the taste and convenience just like I did. Give it a shot in this fab wrap and be sure to let me know what you think. Enjoy! 1. 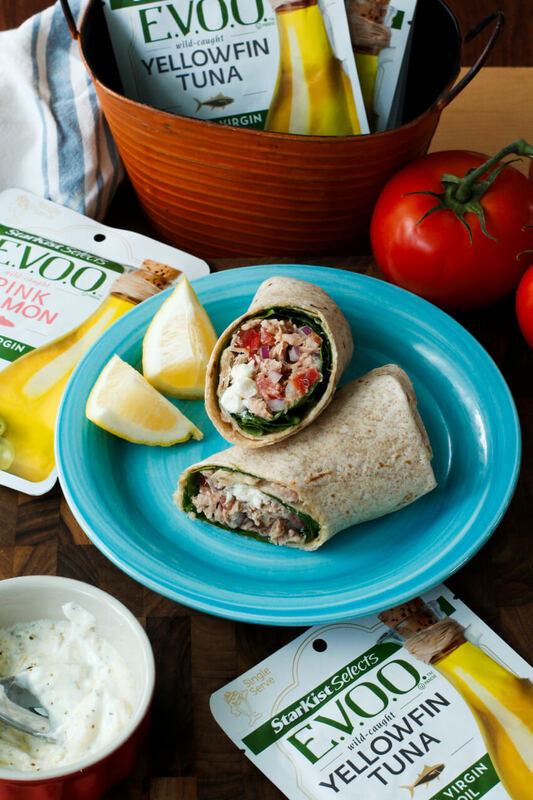 In a bowl, combine the StarKist Selects E.V.O.O.™ Yellowfin Tuna, red onion, and tomato. Set aside. 2. In another bowl, combine the Greek yogurt, olive oil, lemon juice, 2 tablespoons of the feta cheese, oregano, salt, and pepper. Set aside. 3. Place the spinach in the center of the tortilla. 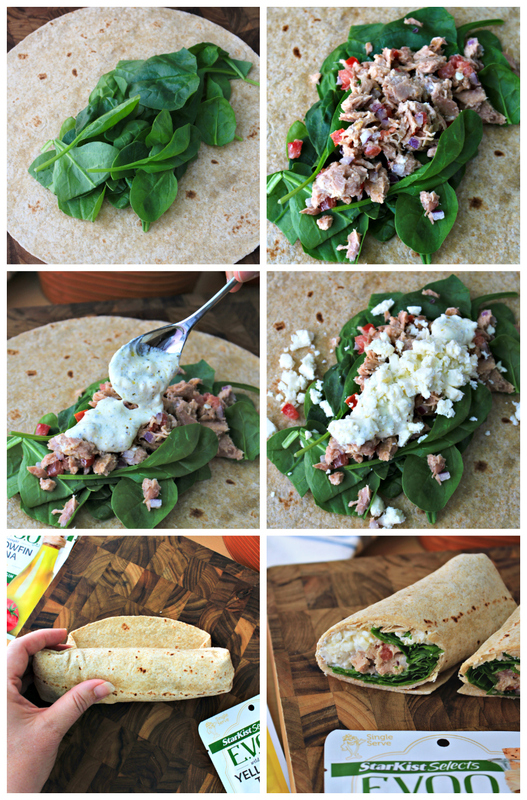 Top the spinach with the tuna mixture and drizzle with some of the dressing. Finish with the remaining 1 tablespoon of crumbled feta cheese. 4. Fold one half of the tortilla over the filling and begin to roll. Tuck the ends in and continue rolling into a tight wrap. Slice in half and serve. Store any leftover dressing in the refrigerator for up to 3 days.